What Does Code P0421 Mean? If you are reading this, I assume that your OBD-II equipped vehicle has stored a code P0421. This means that the powertrain control module (PCM) has detected a problem with the efficiency of the catalytic converter warm up function for engine bank one. Bank 1 indicates that the malfunction has occurred in the bank of the engine that contains the number one cylinder. The catalytic converter is used to reduce exhaust emissions from diesel and gasoline fueled engines. It is constructed using a filtration element of ceramic and precious metals enclosed in a steel housing and placed in the exhaust pipe. 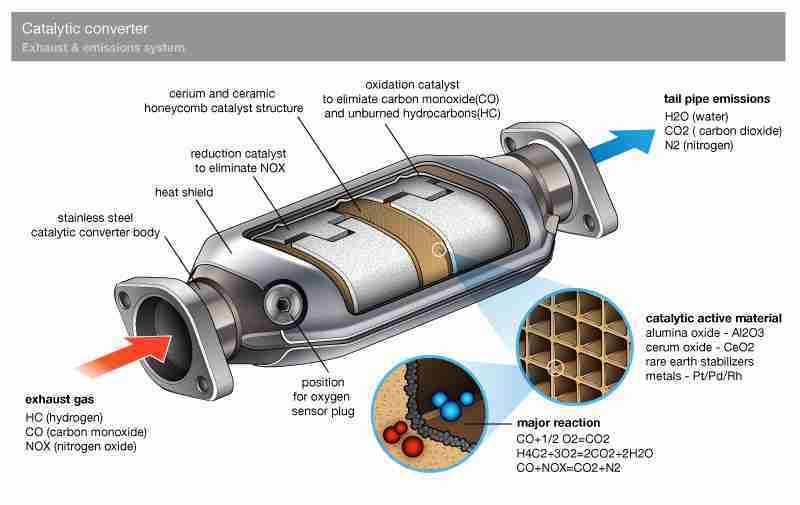 Harmful nitrogen oxides (N2O), carbon monoxide, and unburned hydrocarbons are all converted to harmless ions of nitrogen, oxygen, carbon dioxide, and water inside the catalytic converter. This is accomplished using the dense web of filtration and the extreme heat of the engine exhaust. Catalytic converter temperatures must reach at least 800-degrees Fahrenheit. 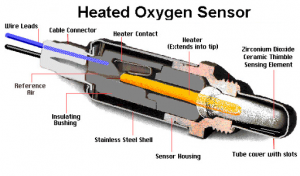 Catalytic converter efficiency is monitored using upstream and downstream oxygen (O2) sensors. The O2 sensors are zirconium dioxide sensing elements enclosed in vented steel housings, connected to wire leads in the O2 sensor wiring harnesses by platinum electrodes. O2 sensor wiring harnesses are connected to the PCM via the controller area network. The O2 sensors provide the PCM with data regarding the percentage of oxygen particles in the engine exhaust as compared to the oxygen content of the ambient air. Spent engine exhaust gases are pushed through the exhaust manifold, into the exhaust pipe, over the upstream O2 sensor, through the catalytic converter, and they pass over the downstream O2 sensor. Exhaust gases flow through vent holes in the steel housing and across the sensing element of the O2 sensors as outside air is drawn into a chamber in the middle of the sensors through the wire lead cavities. Inside the chambers, the air is heated, forcing the oxygen ions to produce (energy) voltage. Deviations between the concentration of oxygen molecules in ambient air (drawn into the O2 sensor) and the concentration of oxygen ions in the exhaust cause voltage fluctuations. These deviations cause the oxygen ions inside the O2 sensor to bounce from one platinum layer to the other, very rapidly and repetitiously. Fluctuations in voltage occur as the surging oxygen ions bounce between platinum layers. The PCM identifies these changes in voltage as variations in exhaust oxygen concentration. These variations signify whether the engine is running lean (too little fuel) or rich (too much fuel). When the signal output from the O2 sensor is lower, more oxygen is present in the exhaust (lean condition). If the voltage signal output is higher, less oxygen is present in the exhaust (rich condition). This data is used by the PCM to compute fuel delivery strategy and ignition timing, as well as other things. If the upstream and downstream O2 sensors reflect a similar exhaust oxygen concentration, a code P0421 will be stored and a malfunction indicator lamp may be illuminated. What are the common causes of code P0421 ? What are the symptoms of code P0421 ? How do you troubleshoot code P0421 ? A diagnostic scanner, digital volt ohmmeter (DVOM), and a reliable vehicle information source (such as All Data DIY) will prove necessary when diagnosing a code P0421. Misfire codes, throttle position sensor codes, manifold air pressure codes, and mass air flow sensor codes should be addressed before attempting to diagnose a stored code P0421. The engine should be running efficiently before diagnosing this code. With a P0421, I would begin with a visual inspection of system wiring harnesses and connectors. Meticulously inspect harnesses that are routed near hot exhaust pipes and manifolds, as well as those that are routed near sharp edges like the ones found on exhaust shields. Proceed by connecting the scanner to the vehicle diagnostic port and retrieving all trouble codes and freeze frame data. Write this information down because it may be helpful if this proves to be an intermittent code. Intermittent codes can be much harder to diagnose. Now, clear the codes and test drive the vehicle. If the P0421 is immediately reset, start the engine and allow it to reach normal operating temperature, then allow it to idle (with the transmission in neutral or park). Use the scanner data stream to observe O2 sensor input data. Narrowing the data stream to include only pertinent data will yield faster data response. If the engine is running efficiently, the upstream O2 sensor will cycle regularly from one-millivolt (.100-volts) to nine-millivolts (.900-volts) and downstream O2 sensor data should reach a mid-line and settle there. If upstream and downstream O2 sensor readings are too similar, after the PCM has reached closed loop operation, suspect a defective catalytic converter. Use the DVOM to check resistance of the O2 sensor/s in question, as well as voltage and ground signals for O2 sensor circuits. Use caution and disconnect related controllers before attempting to test system circuit resistance with the DVOM.